Khalil Mamoon Hookhas are hand crafted in Egypt with steel stems that are fusion welded to perfection. Khalil Mamoon Hookah’s! 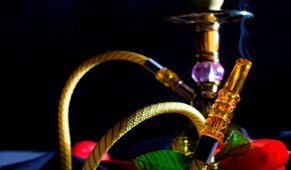 Authentic and Genuine Hookahs. Khalil Mamoon is a company with over 50 years experience of hand making hookah pipes, based in Cairo Egypt and shipped over by us into the USA. KM hookahs are the state of the art traditional pipe in the industry. Khalil Mamoon began his career as a specialist antiques restorer who then turned his love of hookah into a family business, now in its third generation and going stronger than ever. Khalil Mamoon hookahs are renowned for their authentic craftsmanship, unique hoses, and ultra-wide and easy draw. The Khalil Mamoon Original Hookah is the standard by which all hookahs are measured to stainless steel throughout the stem with brass rings and the original stamps of KM initials. The center design is simple Egyptian fare, and is the hookah of choice at many hookah bars throughout. The stem supports the stainless steel tray, while the hookah makes use of thick tubing and strong welds to provide the best in Egyptian quality. Comes with a 69″ KM pro hose known for their wide bodies and larger bore that produces the best airflow of any hose on the market today. The design of the Khalil Mamoon is pure Egyptian styling, known for its intricate designs and attention to detail. All Khalil Mamoon hookahs are handmade and is produced individually, not off a manufacturing line, and not mass assembly. Because of this, every Egyptian hookah has slight variations when it comes to each hookah. You may find the weld lines may be visible and unpolished at the welds. The vases are all hand painted in Egypt, so you might have slight variations in design as well. Khalil Mamoon Hookahs are desired for their attention to the small details that have been ironed out from centuries of manufacturing hookahs in the most demanding part of the world.